The Challenge – When Vermont Adaptive arrived at Pico Mountain in 1999, resort officials provided loaned space on the ground level of the main base lodge. For the next 10+ years, this space served as a home for participant and volunteer check-in, reservations, equipment storage and upkeep. An older out-building provided minimal storage for seasonal equipment. As we grew, it was evident that we were at maximum capacity in this space. The base lodge did not meet ADA requirements in many areas including the lack of an elevator to reach the cafeteria and lounge. Options were limited. Each year we saw an increase in demand for programming, both during the winter and summer months. We needed to address the lack of efficient facility space in order to continue to move the organization forward. room and more — simply put: a layout of a state-of-the-art facility that would address the needs of everyone in the community. The Solution – In November 2013, Vermont Adaptive opened the doors to our rst permanent home in Vermont — the Turtle Ridge Center at the Andrea Mead Lawrence Lodge at Pico Mountain. Vermont Adaptive partnered with the Pico Ski Education Foundation to build the agship, four-season headquarters for their athletes, programs, participants, volunteers, and events. The 6,000 sq. ft. facility is the first of its kind in Vermont. Vermont Adaptive now owns the rst oor (3,000 sq. .) with access to the second floor, owned by the Pico Ski Education Foundation. Designed as ADA-compliant, the building has an elevator, which now provides access for all to the Pico Ski Club, our building, and the second level of the main base lodge, cafeteria, retail shops, and deck. 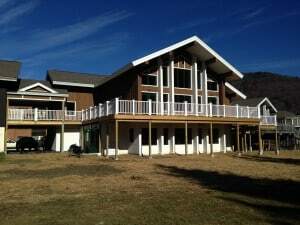 The accessible design allows for better program flow, easy fit-up inside the lodge prior to skiing, private space for participants, a break area for volunteers, a place for training and events, and an overall better experience for everyone.